The Broken Heart Syndrome is also known as Takotsubo cardiomyopathy or stress-induced cardiomyopathy. The syndrome is the result of surging stress hormone levels, usually as the result of severe emotional or physical stress, such as a sudden illness or surgery, the loss of a loved one, a serious accident or a natural disaster, such as an earthquake or crash of an airplane. The high levels of hormones, like adrenaline and cortisol, triggers sudden changes in the heart muscle cells or coronary blood vessels (or both) that prevent the left ventricle from contracting effectively. Researchers suspect that older women are more vulnerable because of reduced levels of estrogen after menopause. In studies with rats whose ovaries had been removed, the ones given estrogen while under stress had less left-ventricle. 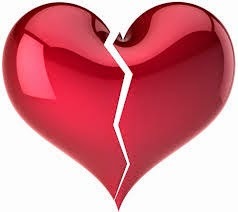 The symptoms of Broken Heart Syndrome mimic those of a heart attack and can be are chest pain and shortness of breath. The Broken Heart Syndrome is treatable and the condition usually resolves within a few days to several weeks.